He was also very accustomed during his youth to run each time to the tomb of the Baal Shem Tov, may his memory be blessed, to request from him that should help him draw close to Hashem. He was accustomed to going there at night. During the winter, at times when it was very cold he would go to the tomb of the Baal Shem Tov at night, from there he would return and go to the mikva. There was one mikva outside the bathhouse and another mikva inside the bathhouse. He would choose to immerse in the outdoor mikva despite the great cold. He was already cold from traveling to the Baal Shem Tov's kever, since it was very far from his home to the cemetery and also from the cemetery to the mikva, aside from the considerable amount of time that he spent by the kever. Despite all this he would go and immerse specifically in outdoor mikva in order to torment himself (sigufim). All this was done secretly at nighttime. 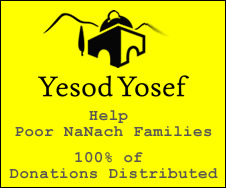 Rebbe Nasson heard from one that heard it directly from Rebbe Nachman's holy lips that at the time when he performed all these actions (sigufim) he was only six years old. He was so secretive with his actions, hiding them from other people that once he immersed in the mikva during the winter and when he returned from the immersion his payot were damp from the water. People around him wondered why anyone would wash their head in the winter, since it did not cross their minds that he had gone to the mikva but rather they thought he had washed his head. They were astonished that he had washed his head in such great cold weather and they considered it one of his childish acts, since he was very extremely hidden with his actions. Also, all the many fasts that he fasted, not a single person in the world knew about them including his parents and relatives. Only his wife alone know about this and he would bound her by an oath not to reveal this to anyone. He would do many, many tricks to hide and conceal all the fasts that he fasted in a way that not a person know about them. Regarding his trip to Eretz Yisroel there is much to tell regarding the great, tremendous and heavy suffering that he experienced going and returning. As well as great effort and self sacrifice and the many obstacles that he had before he merited to reach Eretz Yisroel. We also understood from the things he told us, that in his youth, at the time when he worked very hard with great effort for Avodas Hashem, he used to do all sorts of Sigufim (self tormentations). As it appeared from his words he used to practice all forms of existing Sigufim including Gilgul Sheleg (rolling undressed in the snow) etc... He said the Siguf of holding back and not itching oneself, this is the biggest siguf of all. Meaning, when a person is bitten by things that are close to his body and it is human nature to itch himself each time he feels a bite, he would accept this as a Siguf and whould hold himself back not to scratch, not with his hands, not with his body nor with any other limb. He said this is a very large Siguf, since a person is still and the bites get even stronger and he is forbidden to move with his hands or any other limb, rather he feels each bite in his mind. This is a very large Siguf. Rebbe Nachman did all types of existing Sigufim. Doing them all with simplicity and truth until he merited to what he merited, fortunate is he. As a rule, in all aspects of holiness and separation, both those involving the desires, as well as those involving the bad attributes and also im all aspects of hard work, intensity, hassles and suffering for Hashem, in each and every one of these, Rebbe Nachman was a very wondrous innovation. He was completely removed of all the lusts and bad attributes with total completion, until there was not even left in him even a slight residue from any lust or bad attribute. He merited to reach a fearsomely high level, as high as could be reached. It is impossible to speak at all about the essence of his great level since "All that add, subtract". Everything that we have told over until now, would be considered derogatory for Rebbe Nachman according to the great levels that he merited afterwards. Yet despite this we have related all the above regarding his spiritual service and path during his youth, in order that we should know and understand how there is freedom of choice and every person can merit very great levels if he wishes. Even though it seems to a person that spiritual worship is very heavy and hard, and they are not allowing him to enter the service of Hashem, since the lusts and bad attributes constantly chase after him. Still despite this he needs to be very stubborn in his service of Hashem and not look at all of this. In these stories a wise person will understand on his own, how even Rebbe Nachman passed through all these obstacles and heaviness. He passed through all of this and despite this merited to nullify it all since he truthfully wanted to serve Hashem and chose life with truth until he merited what he merited. Rebbe Nachman said even if he was not a descendant of the G-dly Baal Shem Tov, may his memory be blessed and even if he came from the lowest Jewish family, he still would have merited what he merited, through his intense worship and hard effort that he greatly, greatly worked and toiled in the service of Hashem. Rebbe Nachman was particularly stringent about those people that held the high levels of a Tzadik and the spiritual attainments he merits are due only to his soul, since he has a very high soul. He said this is not true, rather the main thing this is dependent on are his good deeds, hard work and sacrifices. He said explicitly, that any person in the world can merit the highest levels. As this is only dependent on a person's free will, if he wants to have mercy on himself and settle his mind very well to acknowledge what is truthfully good for him and "everything is according to the quantity of action". Even the awesome miracles that we saw from Rebbe Nachman, his memory should be blessed, we are not bothering with those to recite them, since they are not considered praise at all for him, according to his tremendous level. We have only told over what is relevant to the Service of Hashem, to awaken the wise one who seeks truth. There is no excuse in the world and any person could merit high levels if he were to proceed and follow in the paths of Rebbe Nachman, of blessed memory, that are found in this book. However the main thing is to be very acquainted with prayers and requests. Especially to speak between yourself and your creator in your native tongue. To do much conversation in front of Hashem, to appease and convince Him and to plead before Him that he should bring you close to his service in truth. This paragraph is enough for all those that seek truth.